Elvis Catro, Karla Quinones, Won Joo Choe, Manwen Ye, and Marvin Rodiguez work on Silver International during their 5th period class. Silver International, the first international student newspaper in Montgomery County and one of the first international newspapers in this country, is celebrating its 15th anniversary. Starting in the 1986/7 school year, Mr. Joseph Bellino, the ESOL Resource Teacher, encouraged some students to start this newspaper. "I wanted students to know that when we write things we don't write them for a class, we write them because we have something to tell people," he said. "Also I knew that there were a lot of interesting stories that international students could write about." At the beginning creating a newspaper wasn't easy. "I didn't know how to do it", Mr. Bellino said. "But when we got computers with computer software, it made it a little easier for us." Another problem was that Silver International didn't have a class where students could go and learn how to create a newspaper. "Everything was done after school but we learned a lot from the school newspaper, Silver Chips. But it was still difficult because people didn't have a lot of time and some students were not very committed," he said. Silver International staff members had meetings once a week but some people came only once a month so there were just a few students who did most of the work. In 1997 the school approved a class for students to take during the school day. 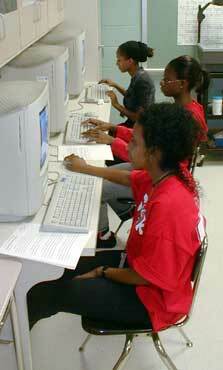 Tizeta Girma, Darlene Doku, and Hirut Erge work on their articles for Silver International. Mr. Bellino believes the newspaper has done a lot of good for the school. "I found out that students who wrote for the newspaper felt very proud," he said. "Also I found a lot of native English speaking students in the school who learned things about international students from reading the newspaper. There were some students who used to come to our after school tutoring programs and when I asked them why they came, they said that it was because of what they read in Silver International," he said. Mony Peang was one of the students who started the paper 15 years ago. She is from Cambodia. Also she graduated from the University of Maryland and now she is working at the National Institutes of Health. Mony was in Silver International just for a short period of time but in that time she learned a lot from the newspaper. "I got on the newspaper in my junior year and it meant so much for me because it taught me a lot of things from different cultures and it also taught me to appreciate who I am." She also said, "It was very helpful for me in my writing skills." Junior Destine is a 12th grader at Blair H.S. He has been in Silver International for two years and he is very happy being on the newspaper. "I like Silver International because it is a mix of students where we can write about our countries," he said. Liwen is also a 12th grade Blair H.S student. "I like the newspaper because it gives me the opportunity to write about my culture even though some times it is difficult for me because my English is not real good at all. But I try to do my best," she said.